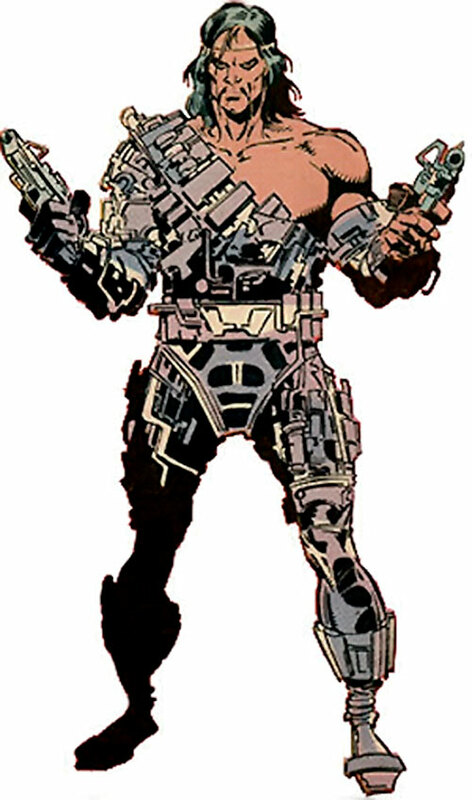 Scalphunter is a member of the Marauders, a group of mutant killers who has repeatedly clashed with the X-Men. 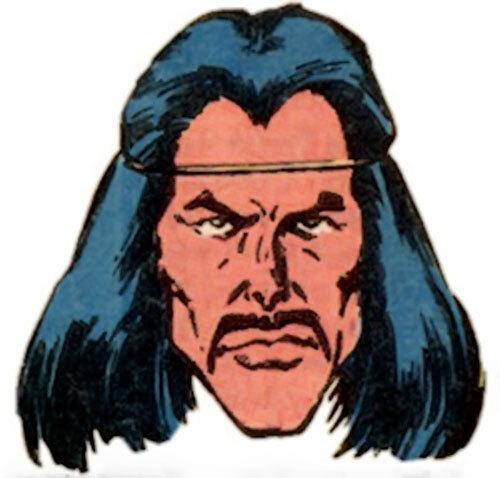 He and most of his colleagues first appeared in 1986, during the “Mutant Massacre” storyline. This profile is an old one. Which means that it less detailed than more modern profile. More importantly, it means that it was done before there was much character development for the character. 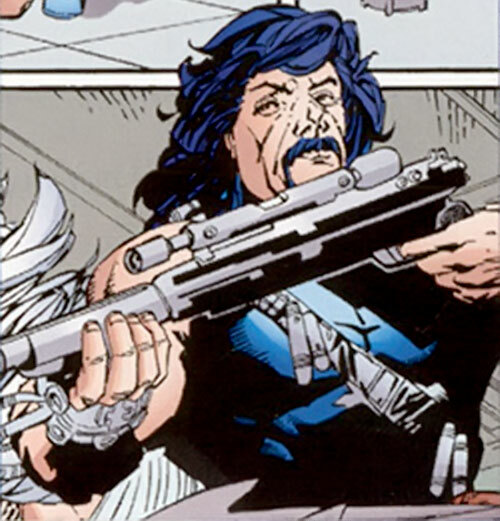 When this writeup was done, Scalphunter was still mostly a costume, a moustache and an arsenal. No offence to moustaches. Real Name: John Grey Crow. Height: 6’6″ Weight: 175 lbs. Scalphunter is a terrible killing machine. He employs a full bodysuit of various weapon pieces which he quickly may assemble (and take apart) into any sort of offensive weapon : machinegun, micro-missile launcher, flamethrower, two-handed sword and so on. Being a former military man he knows many military skills and the art of unarmed combat. Scalphunter is also an able leader and tactician. His orders are only overruled by Malice or Sinister himself. All the Marauders are also supposed to have superhuman mutant powers. However, Scalphunter has so far not clearly exhibited any. It would seems that it is his aggressiveness, martial skills and his peak physical abilities that are his real mutant power. It is known that the Marvel Universe has many non-superhuman mutants whose only power is extreme talent for some craft. Scalphunter could thus be an abnormally powerful example of that strain of mutant. Scalphunter’s attitude probably originates from a military or mercenary background. He first appeared as the commander of the Marauders, sent by Sinister, during the slaughter of the Morlocks. Later, he led a failed assassination attempt against Madelyne Pryor. It is evident that all the current Marauders are clones from the original ones (created by Sinister) who already have died in combat. Scalphunter is still at large as a Marauder being employed by Sinister for various killing missions. Scalphunter looks like a hunter. His entire body except the head and left arm is covered with various weapon pieces. These can be attached into any weapon configuration by his quick hands. The weapon parts look metallic and makes him appear really tough. He has purple hair, purple eyes and a purple mustache. Scalp also wears a metal collar around his neck and two metal armbands around his left arm. Lastly he wears a pair of gray boots, a pocket belt and a holster. He is usually seen around with a nasty grin on his face ready to kill the next victim. Scalp is clearly the leader and apparently also one of the most powerful of the Marauders. Scalphunter is the most cold-blooded killer of the group of the Marauders. His objective is always to kill his target, and he will always make certain that he has enough force on hand to achieve this objective. Clearly Scalp studies the opponents of his next mission very carefully until he knows their strengths and weaknesses. Scalphunter is loyal to Sinister. He really enjoys working with the Marauders as their tactical commander in combat situations. 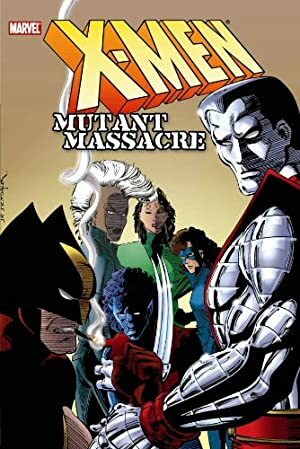 He usually talks down on his victims, and points out that he as a mutant is killing his own kind, before killing them and enjoys giving out orders. All Marauders do care about rescuing their teammates in combat, but may mock each other for the smallest failures. He appears to talk in a southern accent and always moves fast. Scalphunter is fond of his teammate Arclight and the two are lovers. Scalphunter is a mutant assassin (how many are there really ?). He could probably be employed as an assassin for hunting down metahumans, together with the other Marauders, under the services of a mysterious and powerful villain such as Darkseid. Making Scalphunter hunt metahumans of course makes him a metahuman as he likes to hunt his own kind. The nice thing is that the Marauders can return even after their apparent demise as Sinister readily clones new ones; Marauders that again are ready for new tasks. Fabricate allows for Italized Attributes. Fabricate can only be used to create a set of weapons (see below for list) and requires that he takes the parts from his costume (-1). Expertise (His next prey), Iron Nerves, Leadership. COSTUME [/BODY/ 08, Omni-Weapon ability (x2) C-Omniability 13, Note: Omni-ability can only be an offensive power (-1), Note: costume also carries parts that he uses to assemble into weapons, R#2]. Using his suspected mutation, Scalphunter can very quickly assemble a very wide array of weapons from parts that he carries on his costume (Fabricate). Non-standard, more powerful or exotic weapons are paid for using HPs and his Omni-Weapons. The weapons that Scalphunter always has access to (using Fabricate) are found below. Note that he seems to prefer the heavier ones. Barrett M95 Anti-material Rifle .50 [BODY 4, Projectile Weapons 8, Range 9, Telescopic Vision 5, Ammo 6, R#2]. Colt Delta Elite [BODY 4, Projectile Weapons 4, Ammo 8, R#2]. Desert Eagle .50 [BODY 4, Projectile Weapons 5, Ammo 9, R#3]. Gerber MKII Combat Knife [BODY 8, EV 3 (6 w/STR, 8 w/Martial Artist)]. Heckler & Koch UMP Submachinegun or Micro-uzi machine pistol (x2) [BODY 4, Projectile Weapons 5, Ammo 4, Advantage: Autofire, R#2]. M1 Bazooka [BODY 4, Projectile weapon 8 (Area of effect 0 APs), Range 6, Ammo 1, Drawback: Very Long Reload Time]. M1014 Combat Shotgun [BODY 4, Projectile Weapons 6 (Diminishing), Range 3, Ammo 7, Advantage: Scattershot, Drawback: Long Reload Time, R#3]. M16 Assault rifle [BODY 4, AV 4, Projectile weapons 6, Ammo 8, Advantage: Autofire, R#2]. M2A1-7 Flame-thrower [BODY 4, Flame project 7 (Area of effect 0 APs), Range 3, Ammo 7, MPR (cumbersome), Drawback: No Reload In The Field, R#4]. M60 Light Machinegun [BODY 4, AV 5, Projectile Weapons 8, Ammo 6, Advantage: Autofire, Drawback: Long Reload Time, R#3]. M72 LAW Light Infantry Rocket Launcher [BODY 4, Projectile Weapons 9 (Area of Effect 0 APs), Range 6, Ammo 1, Drawback: No Reload in the Field]. M79 Grenade Lauching Rifle [BODY 4, Range 7, Ammo 1, R#2, Note: Will launch 40 mm offensive grenades (BODY 3, EV 7 (Area of Effect 1 AP), Drawback: Grenade Drawback, R#3)]. Pancor Jackhammer Assault Shotgun [BODY 4, Projectile Weapons 8 (Diminishing; Area of Effect 1 AP), Range 3, Ammo 3, R#2]. Remington M24 Sniper Rifle [BODY 4, Projectile Weapons 6, Range 8, Telescopic Vision 4, Ammo 6, R#2]. Two-handed Sword [BODY 9, EV 4 (7 w/STR, 9 w/Martial Artist)]. Scalphunter may use any type of ammunition with his firearms (see the many details under new rules), but the GM may charge HPs for using non-standard bullets. He is also likely to have access to various firearm gadgets, such as scopes, underbarrel lights, silencers, laser sights, red dot sights and extended magazines. Like a true professional, Scalphunter carefully studies his prey before each mission (using Research). Having access to Sinister’s database of mutants, he carefully determines his opponent’s strengths and weaknesses. As he then leaves on the mission (usually extermination) he brings suitable weapons to defeat that opponent. In game terms, Scalphunter has already built the the most suitable weapon for that victim when they meet and has it handy for use. Additionally, Scalphunter benefits from his Expertise (His next prey) trying to answer any question pertaining the victim’s habits, hometown etc. Source of Character: X-Men comics, Marvel. Helper(s): Seb Andrivet, Nick Yankovec, John Colagioia.